MÜNSTER - Die länder Asie nach irer gelegenheit biss in Indiam werden in diser tafel verzeichnet. MÜNSTER, S. - Die länder Asie nach irer gelegenheit biss in Indiam werden in diser tafel verzeichnet. Die länder Asie nach irer gelegenheit biss in Indiam werden in diser tafel verzeichnet. - MÜNSTER, S.
Title : Die länder Asie nach irer gelegenheit biss in Indiam werden in diser tafel verzeichnet.. Size : 10.1 x 13.5 inches. / 25.6 x 34.3 cm. 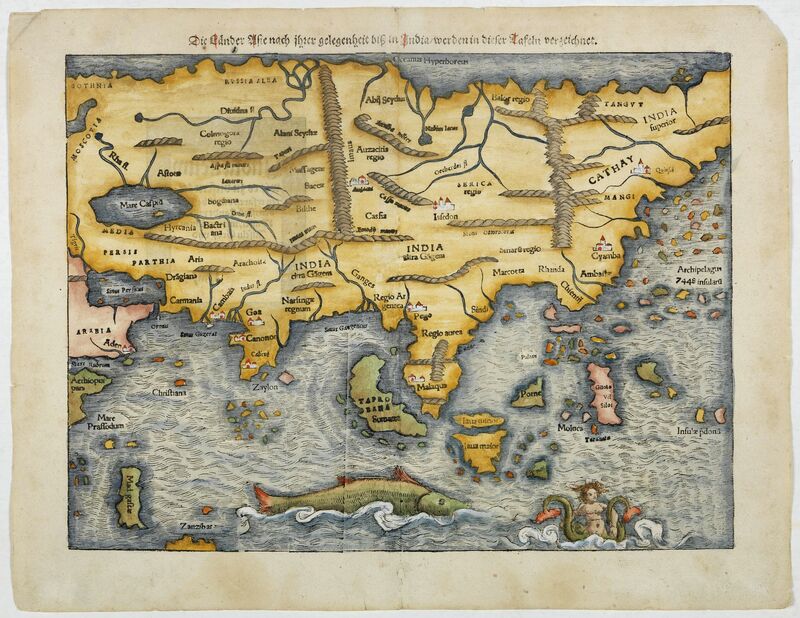 Description :One of the first European maps of Asia. Although quite crude, Münster's map does significantly improve upon the Ptolemaic model for the area. The coast of China begins to emerge in recognizable form, although Japan is not shown yet. Münster's highly important map of Asia, a veritable masterpiece of Renaissance cartography Münster's India Extrema, XIX, Nova Tabula is a very elegant map, that embraces most of Asia, from the Persian Gulf to the Far East. Although largely based on Ptolemy's ancient template, it includes some advancements gleaned from recent Portuguese discoveries. The outlines of the Indian subcontinent, between the Indus and the Ganges rivers begins to take a recognizable form, with "Zaylon" (Sri Lanka) correctly appearing as its own island. The Portuguese outpost of Goa and Calicut, the first place where Vasco da Gama landed in 1497, are depicted. Further to the east "Taprobana" (the name Ptolemy gave to Sri Lanka) is also designated as "Sumatra.". On the adjacent Malay Peninsula is the important trading port of "Malaqua" (Malacca). Java is also portrayed, but is depicted as two separate islands. "Moloca" (The Moluccas), the Spice Islands that were a major point of contention between Spain and Portugal are shown. The resolution of the dispute was the official purpose of Magellan's epic circumnavigation. The depiction of "Cathay" (China) is shown to be largely predicated on Venetian lore. The seas to the south of the map are adorned with a large sea monster and a mermaid with a bifurcated tail. Condition : Wood block printed map. Very good condition.